The Freedom Harness (Made in the USA) Makes Walking Fun! This harness features a patented control loop, on the back of the harness, which gently tightens around your dog’s chest to discourage pulling and makes walking your dog an easy, more enjoyable experience. The chest strap is made of Swiss velvet to prevent chafing. 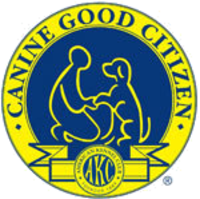 The harness has four adjustment points and the hardware is stainless steel to Keep Your Dog Safe. 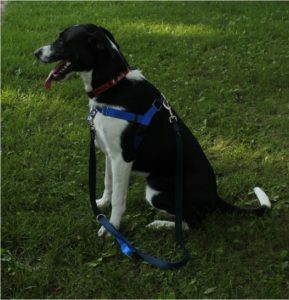 Because you can attach the included 5′, double clipping leash to the front and back of the harness, it Gives You Better Control. This harness also comes with a free three year warranty. Available colors for pick up at My Hero Dog Training: Navy/Royal Blue, Raspberry/Black, Purple/Black, Turquoise/Silver. 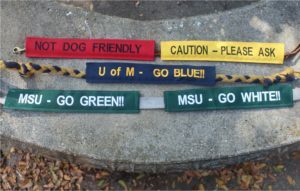 Other colors can be special ordered, $7.99 Harness will be shipped directly to your house from the factory. 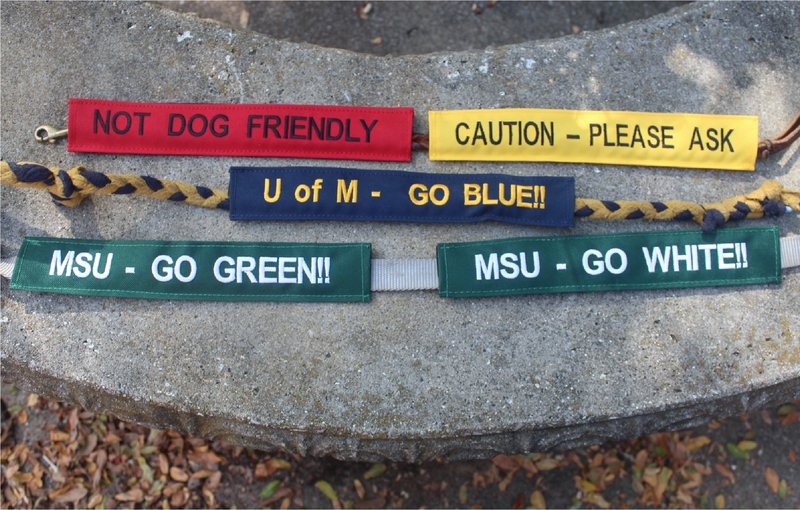 Do you want to tell others to stay away from your dog or ask first (Have a red bandanna or yellow ribbon dog)? Want to show your school pride or just want to make a statement? These leash sleeves easily fit all leashes. They can be custom ordered (color & personalization). Be creative and unique! Leash sleeves colors: black, mocha, red, pink, green, royal blue, yellow, khaki, purple, camo, navy and orange.